Troy Harris and Kareem Wallace. CORRECTION: This article was written under the impression that the Tilt crowdfunding campaign for Grassroots remains active, when in fact it was completed in May of 2014. The most current information on the Grassroots project can be found in an article published last October by The Daily Pennsylvanian. An update on the status of the campaign, if and when available, will be added to this article. We sincerely regret the error. 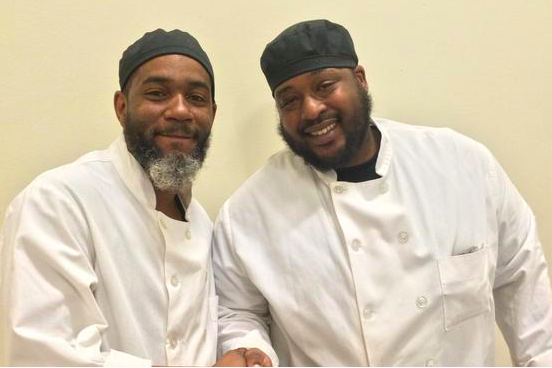 A pair of enterprising cooks who together spent nine years at the University of Pennsylvania are striking out on their own with a mission to employ and inspire at-risk youth in West Philadelphia. Troy Harris and Kareem Wallace have spent years working for a lengthy list of catering companies, most of which they felt offered little in the way of financial security or career advancement. Last year, at Penn's Hillel dining hall, Harris and Wallace even spearheaded a successful campaign to improve working conditions, increase wages, add a new chef, and obtain union representation. Above and beyond personal gain, however, their ultimate goal is to provide an example to teens and young adults that life doesn't have to be a struggle without dignity. They don't have to turn to an illicit hustle or feebly accept substandard wages, a position even the U.S. Supreme Court is beginning to acknowledge. In recent months, Harris and Wallace launched a Tilt campaign to crowdfund their vegetarian food truck concept, Grassroots, which will legally employ young adults and direct all profits toward the establishment of a youth mentoring program called "A Few Good Men." The way Tilt works, each campaign must surpass a designated funding level in order to obtain donations at, below or above their target. Harris and Wallace set a goal of $70,000 and, after getting a boost in publicity from Business Insider, crossed the Tilt threshold of $41,025.64. To date, they've raised $42,135.50 in donations. The campaign expires May 8. All donations will be used to cover the cost of a $40,000 food truck, $1,540 in licenses (vendor of food license, commercial activity license, sidewalk sales license, food establishment license, curb market license, mobile food vending unit plan), and $28,460 to cover six months of operating costs. Once up and running, Grassroots will specialize in pastas and paninis, with several vegan options on the menu as well. Those interested in making a donation to support Grassroots can do so over at the Tilt campaign. As for Harris and Wallace, their years of hard work and dedication have already positioned them as community leaders.